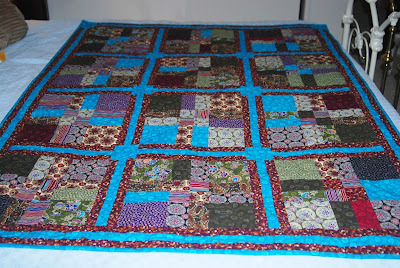 Here are quilts I have made. You can click on any of the pictures for a closer picture. 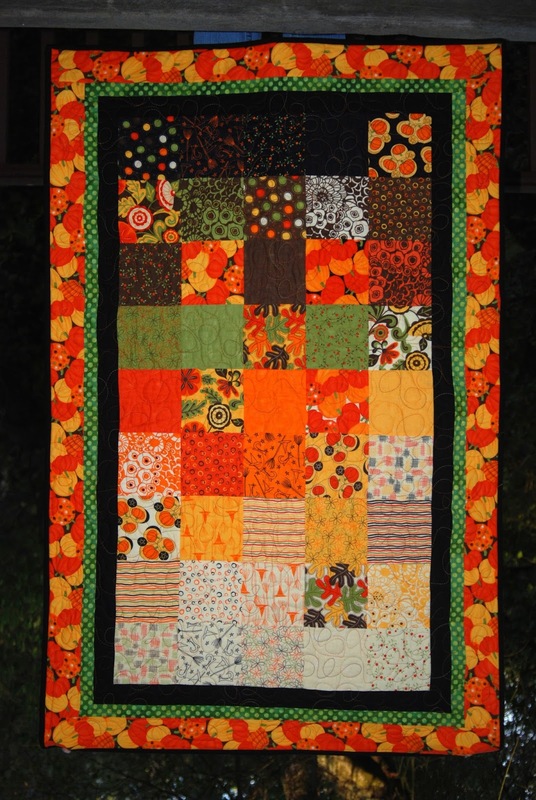 Here is the Halloween Quilt I made in 2015. I bought the pattern at Quilter's Corner. I put my owl silhouette block in this one, too. 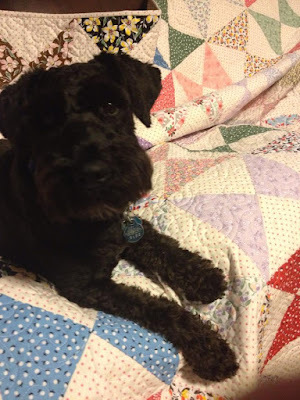 I think I have used that same silhouette in four different quilts now. I really like it. I make a Halloween quilt every year. In fact I have more Halloween themed fabric than any other theme. Amazing. I love Halloween and/or fall fabric. The colors make me happy. 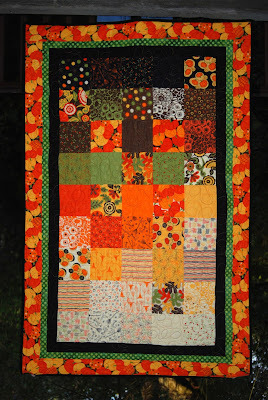 In 2014 I made the following Halloween quilt. I really liked how it came out. I used a panel and made pieced blocks of different shapes and sizes and put my lovely owl silhouette block in it. I loved it. I wound up giving it to my sister, Anne. 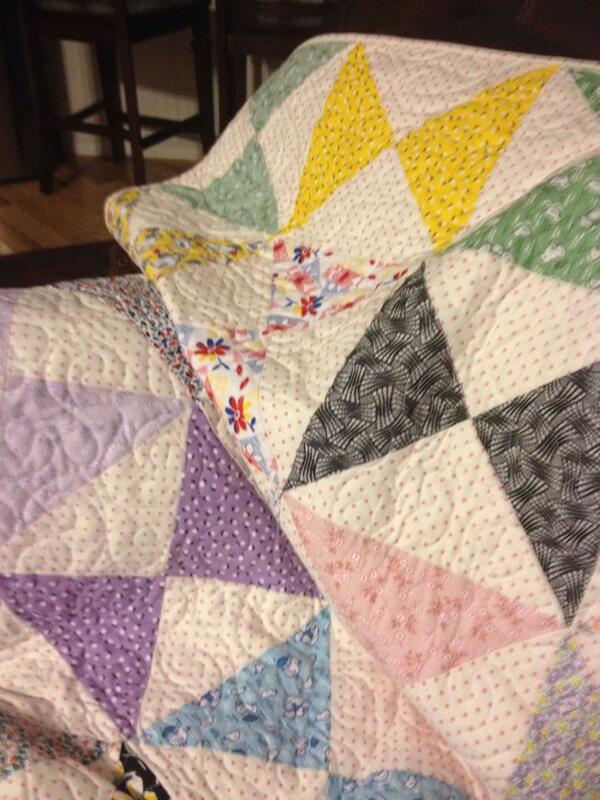 I bought this quilt from a quilter in Rupert Idaho. Well it was just a quilt top when I bought it. I loved the design and colors. It took me a couple of years, but I eventually quilted it on my domestic machine by doing stitch in the ditch. 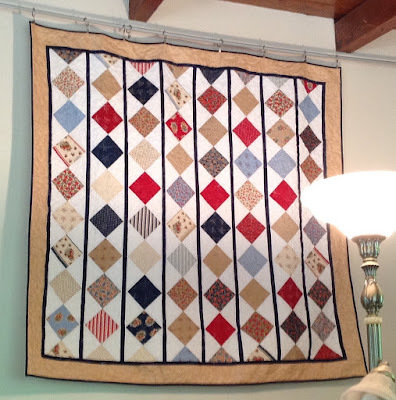 When I had my quilting studio downstairs, it hung on my wall. I thought it was appropriate because of the sewing paraphernalia in the border fabric. After having to move all my sewing upstairs, it just sat in a closet. I finally sold it. I had this Christmas panel that I wanted to do something with. I made a bunch of pinwheel blocks and then put them into this quilt. 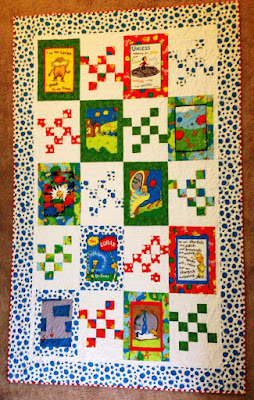 I put the blue border on it but felt it didn't look great with how the quilt looked, so I added some pine threes around the border. I really like how it turned out - and then I sold it. 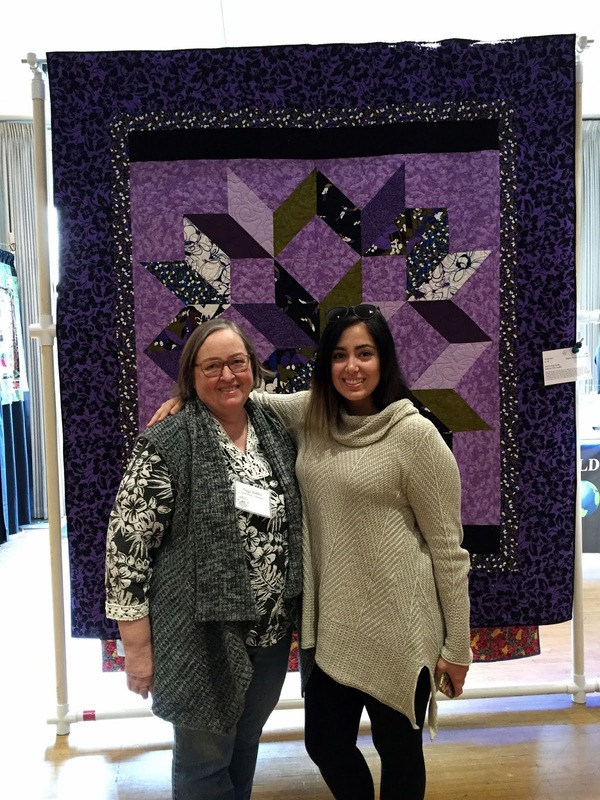 I took a class that the River City Quilt Guild offered. The following is the quilt I made from it. We were told to bring coordinating fabric and some black. We had no idea what the pattern would look like when we made the blocks. I like the fabrics I chose for it, but I definitely wouldn't have done the black squares - but that was how we were instructed to do. In the picture below the black looks good. In person it is a little stark. My daughter-in-law's mother moved in with them due to illness. I took this quilt down to her as a gift at Thanksgiving 2015. I am not sure when I made the following quilt. It was after I moved to Carmichael, so sometime between 2101 and 2015. I hung it on my wall in 2015 around July 4th and then posted a picture of it on my Facebook page. My sister-in-law, Jean, saw it and commented that she wanted me to make one like it for her. I was going to. I really, really was going to. Then I realized I probably never would. So one day after it came down off the wall, I packaged it up and mailed it to her. She called me so totally surprised that I would gift that to her. She loves it. 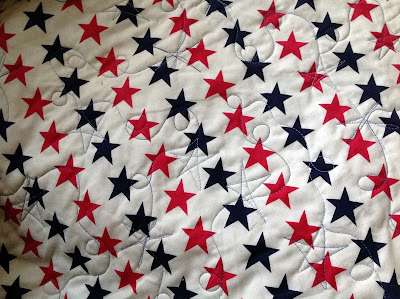 I keep looking at other patterns for a red, white and blue quilt that maybe some day I will make for me to display at patriotic times. 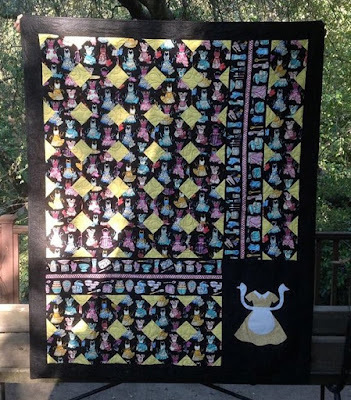 I made a "Stuff Who" quilt using my guild's challenge fabric in 2015. The following picture is that quilt. 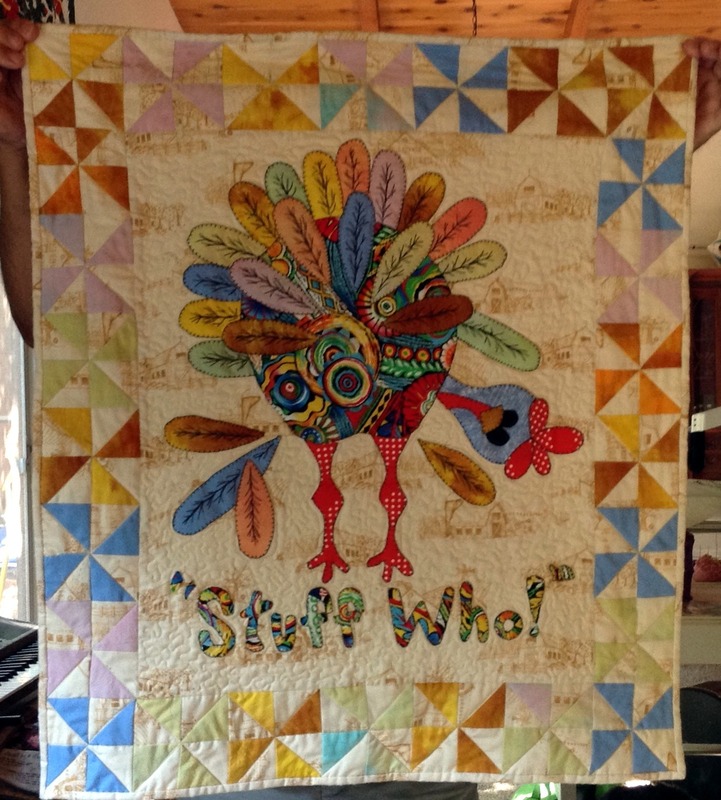 After it was displayed at the quilt show that year, I gave it to my son, Dan, and his wife, Martha, at Thanksgiving time. They hung it on their wall. I was honored. I occasionally decide to make a quilt for someone who is having a baby. We had a missionary that served in our area a little over a year ago. I fell in love with him and his companion. He loved this area and actually baptized a young lady and her daughter while he was here. After he got off his mission, he moved back to Carmichael and married that young lady. 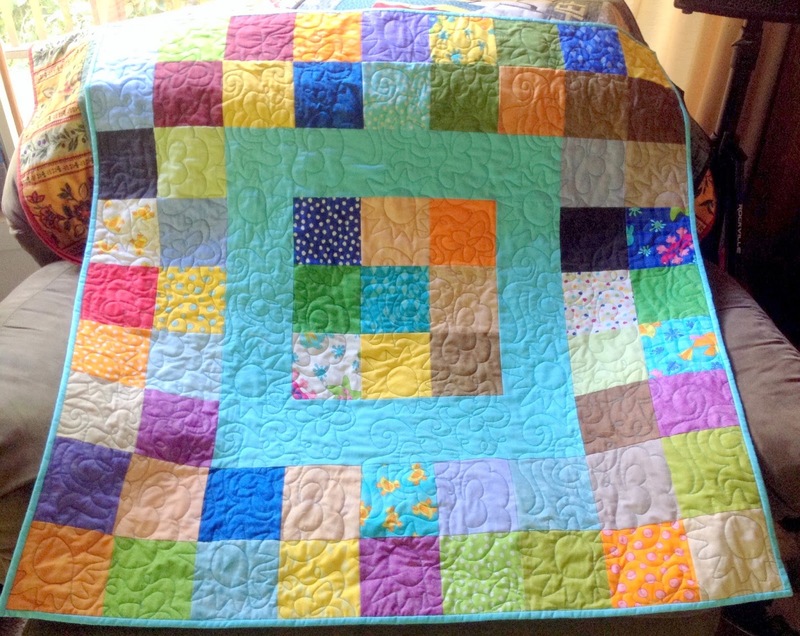 She just had a baby and the following is the quilt I made for that baby. 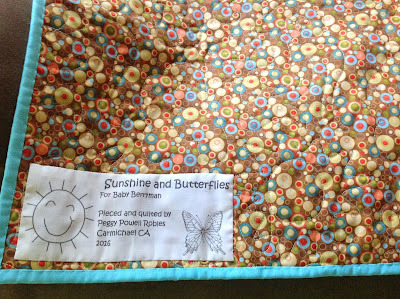 It is called Sunshine and Butterfiles for Baby Berryman - for Elder Berryman, which I still call him. 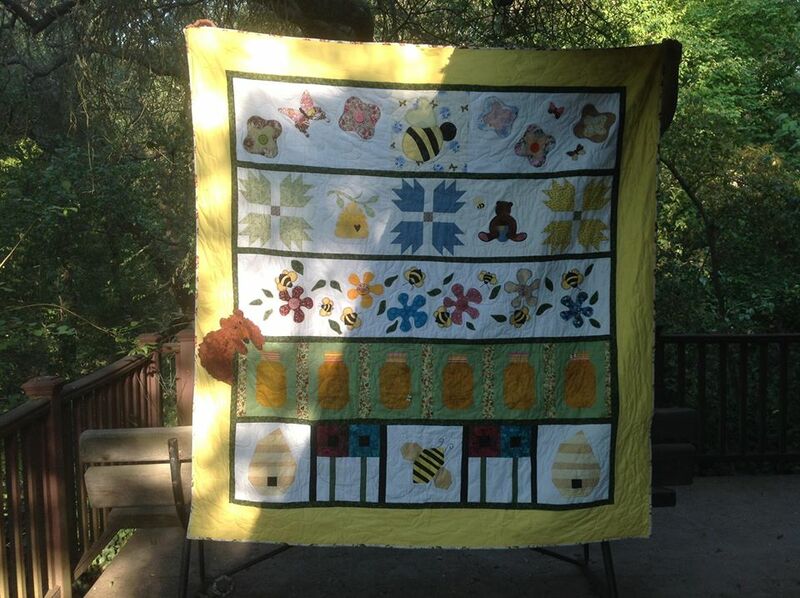 The quilt is called Sunshine and Butterflies because the pantograph I used to quilt has suns and butterflies running through it. 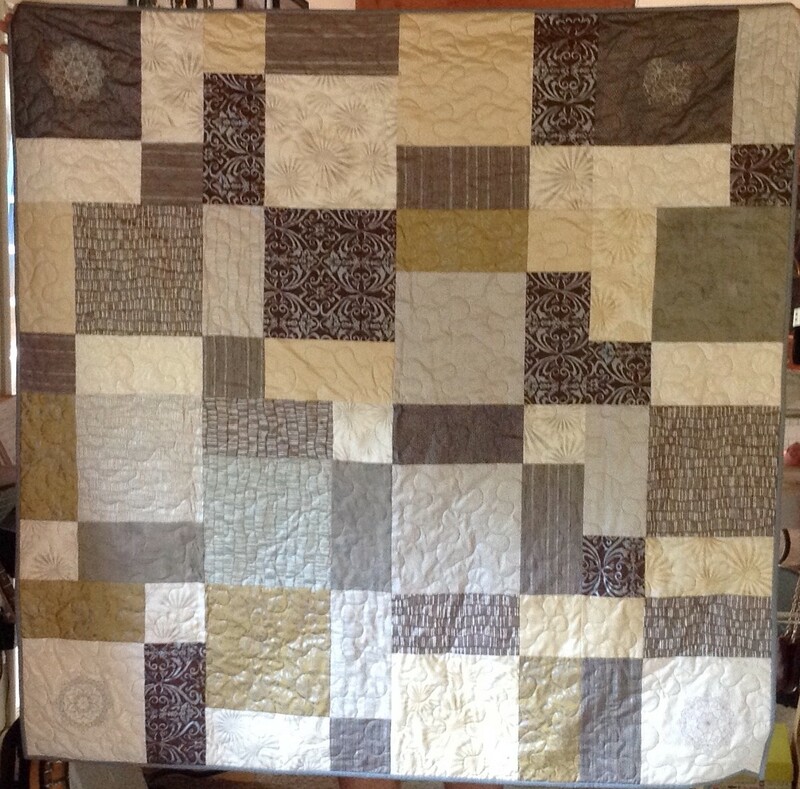 Here is a quilt I am actually submitting to be judged in the River City Quilt Guild show in November 2015. I doubt it will do well, but I have never entered anything to be judged before, or even displayed. Always trying to use my stash wherever possible, the purple background fabric was from my stash. When I first finished this quilt, I was sorry I used the purple. Now I quite like it. It has such a simple name - Purple Star. 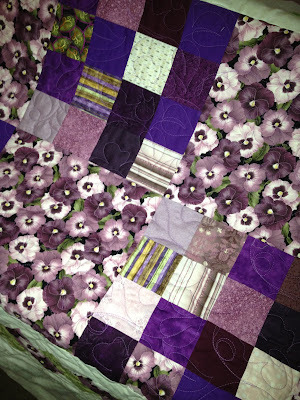 The following picture is of the same Purple Star quilt. It was taken by my daughter, Elisa, at my quilt guild, River City Quilt Guild, in 2015 where I had submitted it for display only, no judging. I am standing with Elisa's daughter, Lorena. This picture was used in a magazine along with two other photos representing the show afterwards. What an honor. I took most of my green fabrics and cut them into five inch squares and sewed them together with no pattern to it. 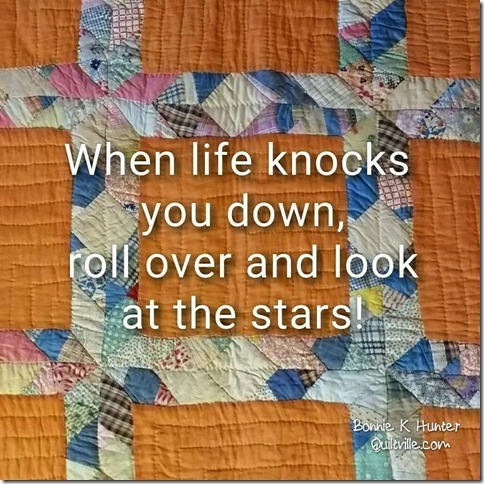 Just a scrappy quilt. This is it. I call it Green. I have one not unlike it called Brown. Even the back took up the rest of one of my favorite greens. Look at the backing Cindy came up with. Love those flying geese! River City Quilt Guild has a class almost every month. Peggy Martin came to do a trunk show at the meeting and teach a class the next day. I took the class and the following is the quilt I made from that class. We were taught to cut butcher paper into snowflake like cuts and attach it to material. Ta da! I designed my own quilt. My mom had her 90th birthday in 2012. At family reunions her one brother, Uncle Park, always led the family is a song entitled Little Purple Pansies. . . in your garden grow. He has passed away but is always close to my mom's heart. So for a present for her 90th, I made the following quilt. Lots of purple and lots of pansies. I included two pictures. One of the quilt up close. Elisa quilted it using a pansy pantograph. The other picture was taken at the birthday party. Gil had hung the quilt up for all to see. Mom was so busy at the party that she didn't even notice it. I had to point it out to her and tell her it was her present from Gil, me and the kids. She was pleased. 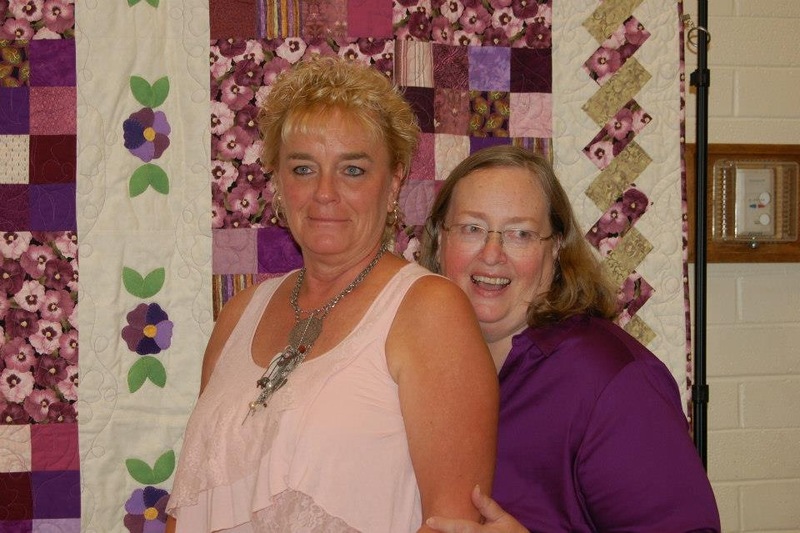 This picture of Mom's quilt was taken at the party. That is my sister, Kris, and me in front of it. 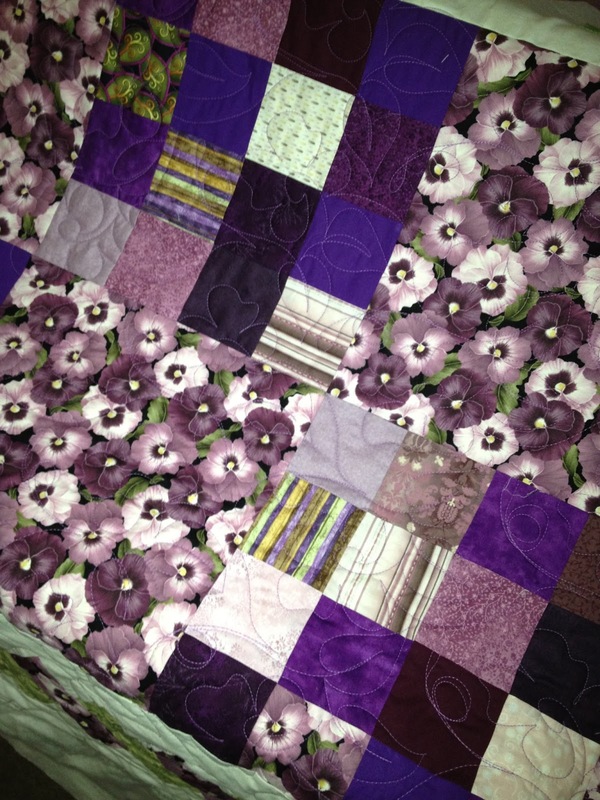 The pansies running down the middle of the quilt are made out of wool felt. It really is a stunning quilt. I told Mom to put in her will it was to go to Uncle Park's son, Craig, as a remembrance of his dad. In the 1980s I bought a scare crow panel from Joann's Fabrics. It sat in my stash for years and years and years. One day about 10 years ago, I brought it out and was going to donate it to Deseret Industries. 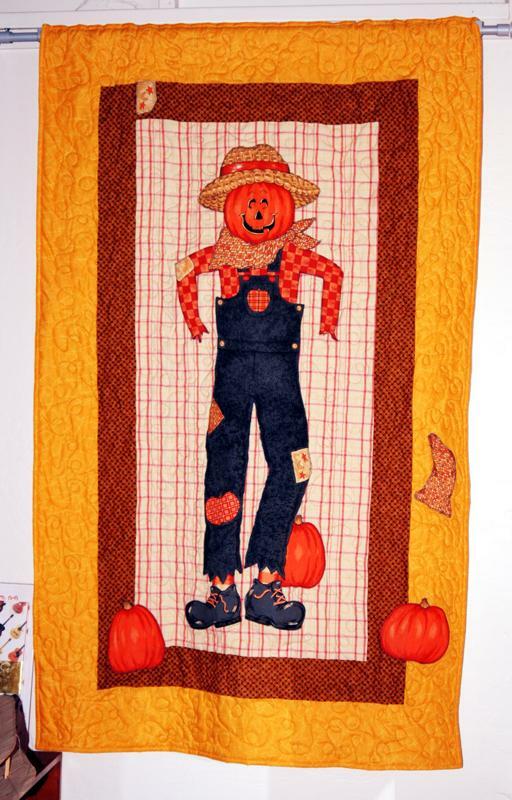 Instead I cut around the scare crow, put fusible fabric on the back and adhered it to a new background. This quilt is about five feet long. I get lots of compliments on it every year. I am really glad I didn't discard this scare crow. Think Green. I like to have a quilt for every occasion. Below is my March quilt. Very small. 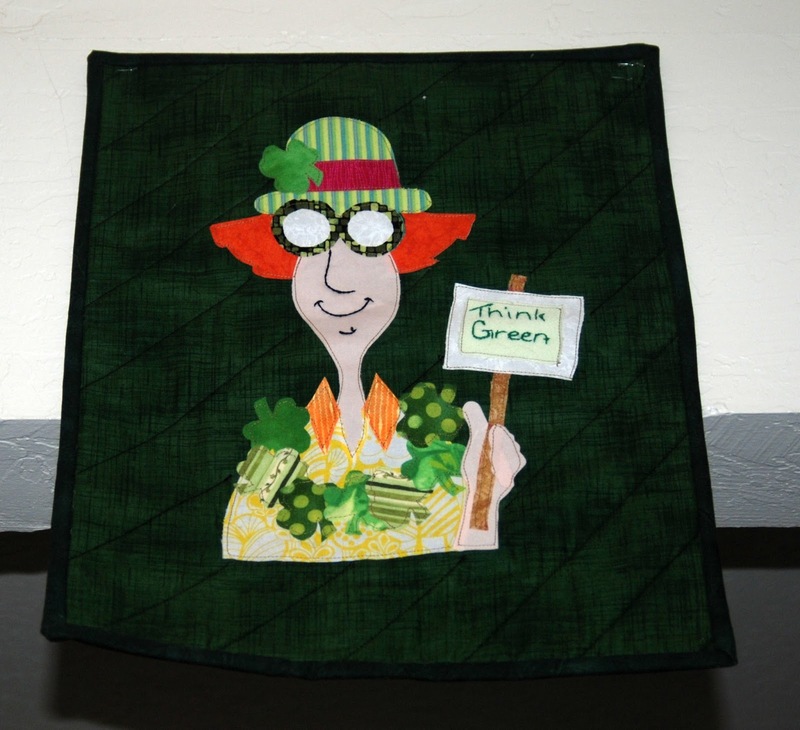 I bought shamrock fabric, three different cuts, several years ago. So far it is still just sitting in my stash. Maybe that is something that will get done before next St Paddy's day. Valentine's Day has never been a holiday for me in any way. Even as a kid, I thought it was silly to have to do Valentine cards for my classmates. That said, I like Valentine materials. I made this in 2008. I used to keep my shop open one night a month. I seldom had too much traffic, so I found it was a great time to make displays for the store. I made this using a die cutter I had to make the hearts. I sprayed them with 505 and stitched them to the backing. Made a cute table runner. I seldom use it on my table. I usually hang it on the wall in February. Very colorful. Venita and I signed up for a three day seminar in Modesto of all places. It was a Ricky Tims seminar. Also there was Alex Anderson and Pam Holland, who is from Australia. He showed us how to make a Harmonic Convergence quilt (see picture below). So easy! After we left the seminar on Saturday, we stopped on the way home at a quilt store. I bought the coordinating fabric and on Monday I made the following quilt. It really is an easy pattern to do and comes together so fast. 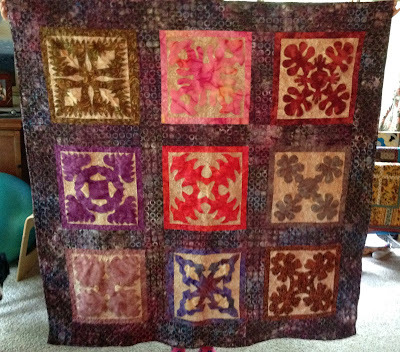 It is one of my favorite "Chantel" quilts. That is Ricky-speak for show and tell. Every once in a while I see a kit on line or in one of the quilting ordering magazines that I think I should buy that. The following is one of those. It was super easy to make and is a perfect wall hanging for February. I love panels, though I don't buy too many now. I seem to be on a piecing kick instead. I saw the following panel and fell in love with it. The shop I saw it in had kitted it up and the price was right, so I bought it. I came home and went to put it together and there were no instructions in the kit. I bought it in a shop about 100 miles from here, otherwise I would have taken it back. So I called the shop and was surprised to hear them say there is no pattern. Just go by the picture and figure it out for yourself. So the following is what I came up with. I liked it a lot. One year I put several of my quilts in the silent auction of my quilt guild show. This was one of them. I sold it. I miss it come Valentine's Day. It is funny. 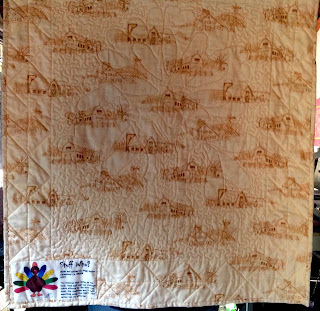 I put 10 quilts in the silent auction that year and sold all but one. I miss all but one of them. I really hate giving up my work. 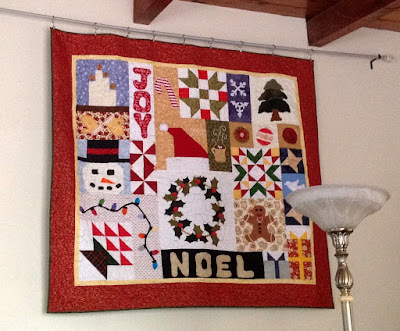 I following this on-line quilter's blog. 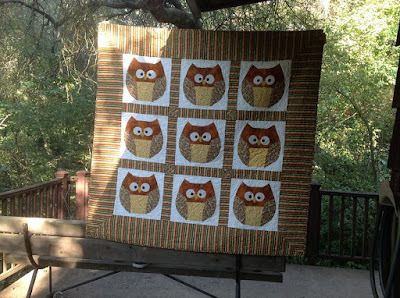 One quilter a couple of years ago was organizing a block swap with a forest theme. I signed up to be part of it. I went on line and found an owl I liked and made up this block. I was to make six to swap and one more for me to keep. So I made up the seven and showed them to my daughter. She said, "Mom, you can't give those away. They are too cute." So I contacted the organizer and apologized and informed her I was backing out of the exchange. Then I proceeded to put this quilt together. It is one of my favorites. I have had several people comment they would like to have it, but I just can't give it up quite yet. That was probably 4 or 5 years ago. It is hanging on my wall right now. Owls are one of my favorite things. My daughter's too. I made this owl for Elisa's Christmas present two years ago. It has a companion pattern that I didn't have time that year to make, too, and promised I would and give it to her some day. Some day has never arrived. They are quite a bit of work. Cute though. I love charm packs. 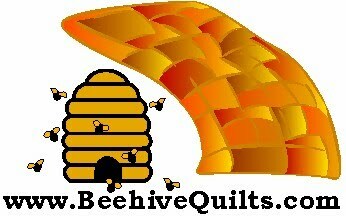 I was first introduced to them when I had my quilt store. I also love Halloween fabrics. I love the oranges, blacks and yellows. The colors just make me happy. I had a line of Halloween fabric that I needed to show off, which included charm packs and layer cakes. I took one pack home one night and came back with the following quilt. I had a lot of offers to purchase this simple quilt. It is one of my favorites that comes out every fall. It was made in 2008. The following was just one of a four part panel of fabric with a border around it. I had planned on making each one into a small wall hanging. This one represented spring. By the time summer, fall and winter came along I had misplaced their corresponding panels. So each spring this one is hung on the wall. It often stays through summer. Oh well. I saw on line a quilt made like this. I figured I didn't need a pattern. Other than not looking like a carrot, which it is supposed to be, I quite like it. It is hung at Easter time each year. Another Easter quilt is the following. Our quilt guild had a flea market each August where the members can rent a table and sell their "stuff" there. As I was trying to sell some of my "stuff," Elisa who was there helping me came back with this as a kit along with four others. The seller was selling them each for $5. You can hardly buy the rack that was included in the kit for double that. She told me I had to get them. They were too cute. Which they were. So most of my nights earnings went to those kits. I have since made this one, a popsicle and flip flop one, and a strawberry one. I have two others yet to make. That was easily six or seven years ago. The following was an embroidery project I started probably 8 years ago. Hand embroidery, that is. I finished the blocks after working on them off and on for several years. Then I put them on my design wall and looked at them from across the room. You could hardly see the flowers in some of them. 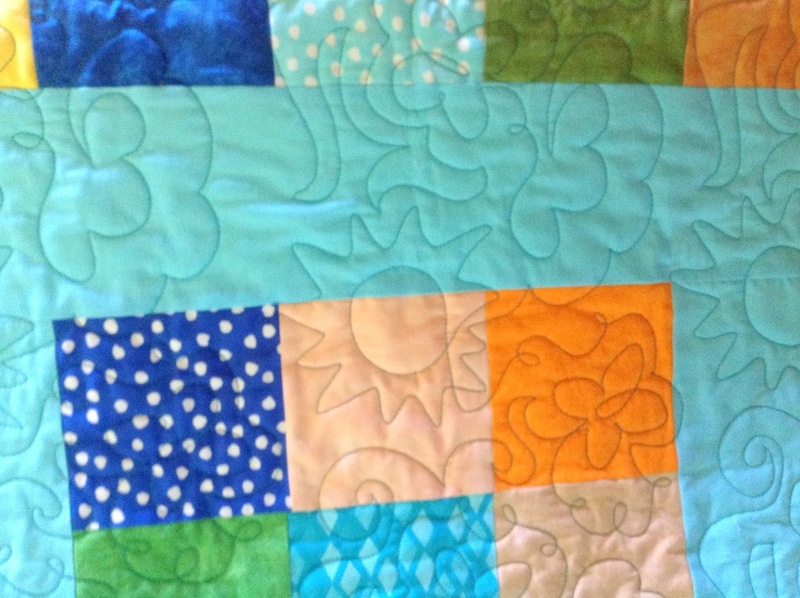 What did I learn doing this quilt? I learned to use a very light background fabric and very vibrant or dark embroidery thread. I got out my granddaughter's Crayola crayons and colored the flowers and even some of the baskets. Then I put a pressing cloth over them and set the colors in with a hot iron. Then the blocks were made into this nice wall hanging. It hangs by my front door where people see it up close. I get a lot of compliments of it. Thank you very much. 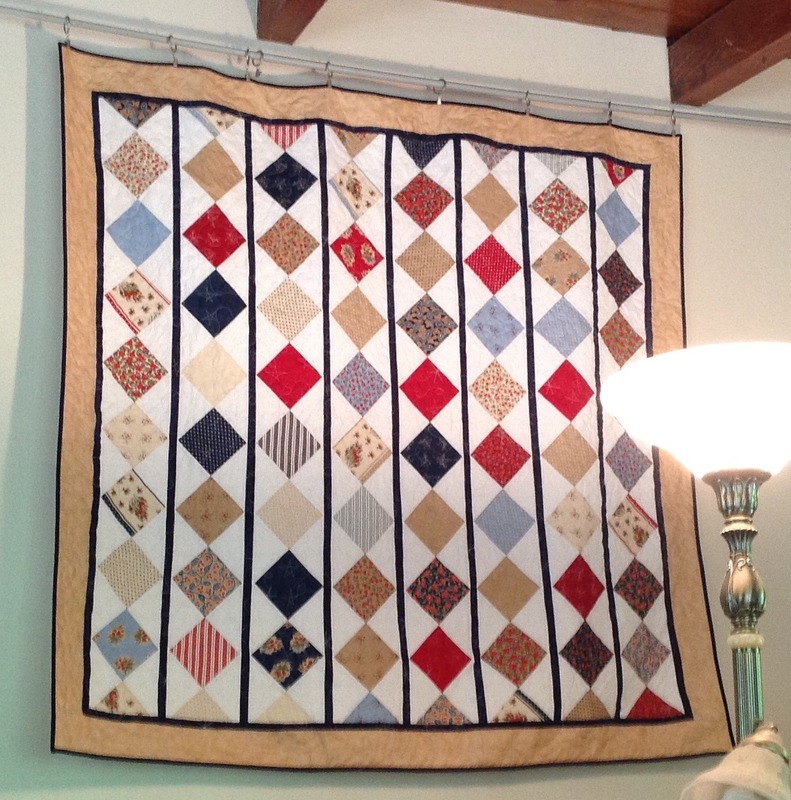 The following quilt was made while my shop was open as a display of the fabric. I sold it in 2013 for $99! It is a very small quilt. The lady wanted it and it was at our guild's quilt show at a silent auction display. She asked how she could be sure to get it. She was told to put a high price on it. She did and got it. 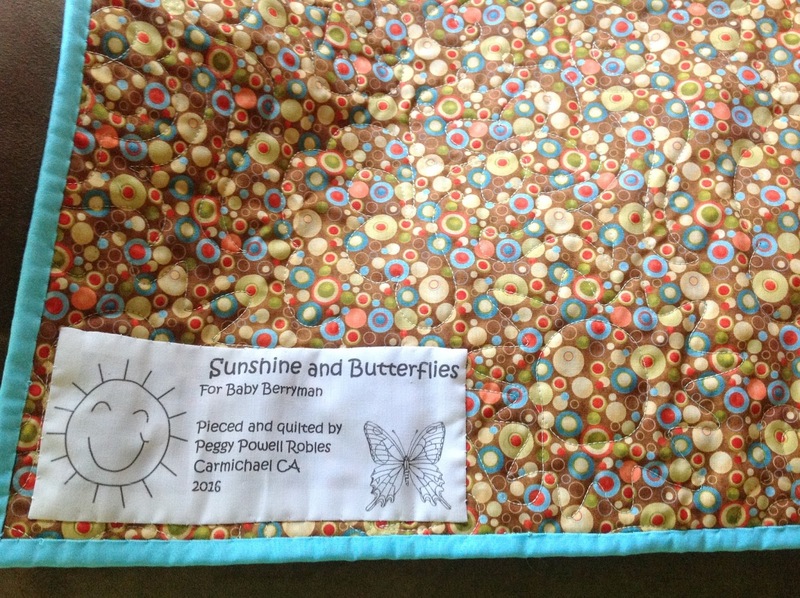 She loved Laurel Birch fabric and loved how this was put together. I loved her. This quilt is one I made to advertise the pattern our shop had "Available" to purchase. It is tiny. Cute, though, with buttons and ribbon for their collars. Pinwheel quilts were all the rage. Still are, I guess. I bought the large pinwheel template and Elisa bought the small one. Somewhere along the line I was given a small charm packet. There wasn't enough to do much with, so I used them with the small template and made this quilt. The pink fabric was a fabric I had on hand. When I was finished making the pinwheels, I felt like I was throwing away more fabric than what was going in the quilt. Plus I didn't label or keep track of the pieces as well as I should have as I cut them out. Boy did I have fun putting the puzzle back together again. I sold the my large template on e-Bay having never opened it. Never again. I get a lot of complements on this quilt. I usually have it hanging in my dining area or on my dining table. It is attractive. There were two lines of fabric I carried in the store that I just loved. One was Taxi by Timeless Treasures. It was yellow, black and white. I bought the whole line twice and still failed to set any aside for me. Boo hoo. The other one I loved was called Jacobean Arbor. When the shop closed, all I had left of it was a few pieces. The following is what came of it. There were actually two different colorways of the same design of fabric. I used both in this. I should take a picture of the back. Gorgeous piece of fabric. 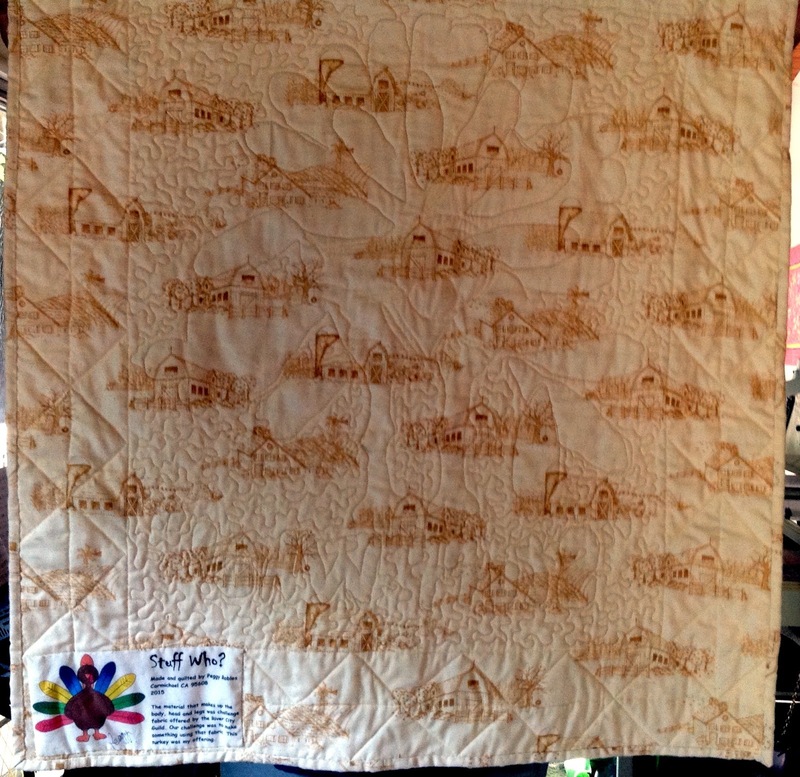 The following quilt was made when I first opened my quilt store. It was just a simple piece of fabric with a border. I made it to show off the patriot fabric inside. I never really liked it. Since then I bring it out every summer and use it on the wall or as a table topper (it is only about 2' x 2') and I really appreciate it. I found the Chicken Laying Colored Eggs on line and had to have it. I loved how the top came out. When I quilted it, I made the mistake of quilting the easier part first - around the blocks. When I started quilting the inside around the eggs and chicken, I had puckers that I could not get out because I had already put secured the outside. Whoops. It is still a great quilt. I learn something with every quilt. Some things I learn are not so visible a mistake as this one was. 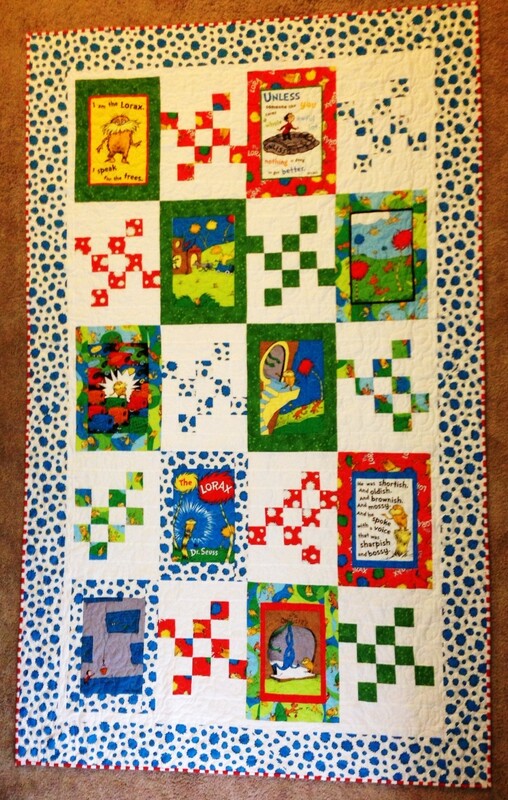 The following quilt is a quilt I made for my beautiful granddaughter, Faith. She was a cheerleader at the time and was the greatest tumbler on the squad. Their uniforms were purple. So I made her a purple tumbler quilt. When it done, I felt it needed something and added the flower. I have not shown it other than at Sew and Tell at my quilt guild. 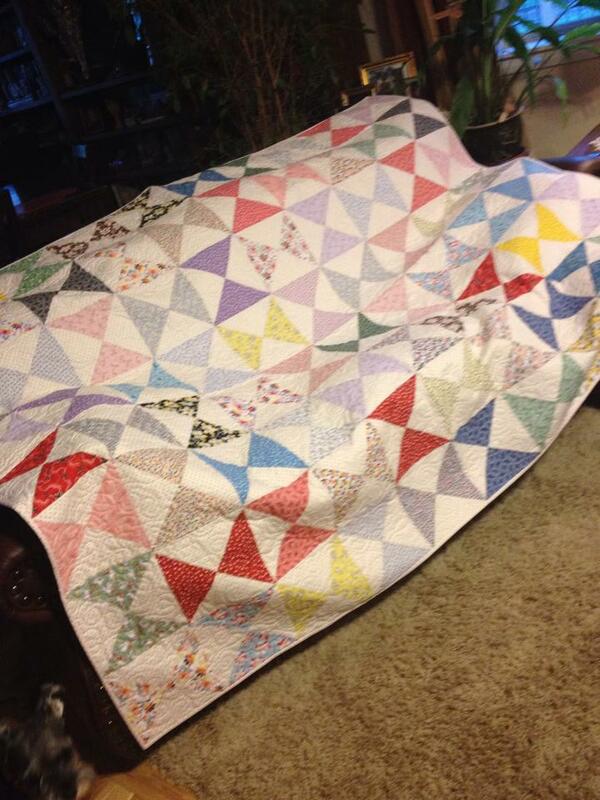 So I borrowed it back from Faith and am going to enter it into my guild's quilt show in November 2015. That is the River City Quilt Guild in Sacramento CA. Below is the flower up close. It was great fun to make but quite hard to attach the center to the petals. My niece, Lyndsay, moved to England several years ago. Her husband was from there and he wanted to raise their son there. She loves it, but she does miss the United States from time to time. Her mom, my sister, saw the following pattern and asked me to make one for her. I bought the pattern and the following is my rendition of it. I am really sorry I didn't make one like it for myself. It was a lot of work to go through my stash and get the fabric that would more or less represent the state it was going to be. One found it would have been easy enough to cut two states rather than just one. Oh well. Maybe someday I will do another. 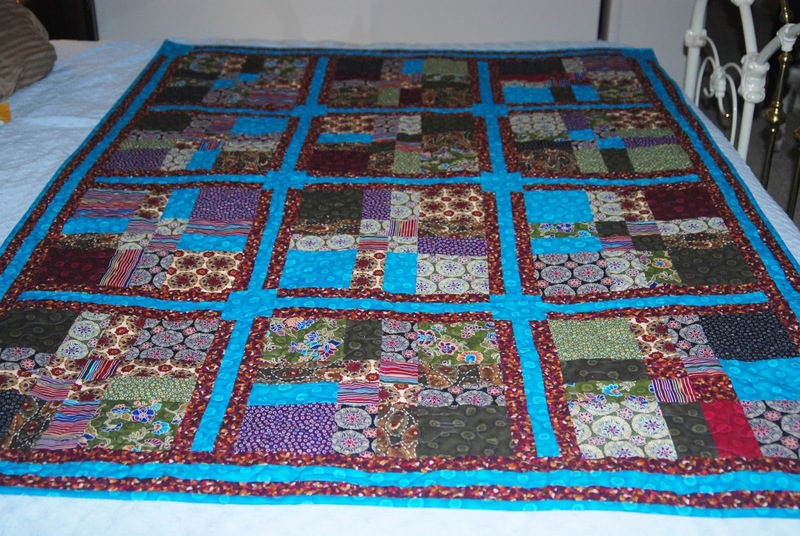 The material I used for this quilt was old fashioned looking aprons on a black background. I made snowball blocks with that fabric as the snowball and a bright yellow (to offset the black) for the corners. As you can see the yellow overtook the snowballs and the diamond patches look like the primary blocks. Learned something on this one for sue. Up close it is a darling quilt, especially with that cute apron in the lower right corner. 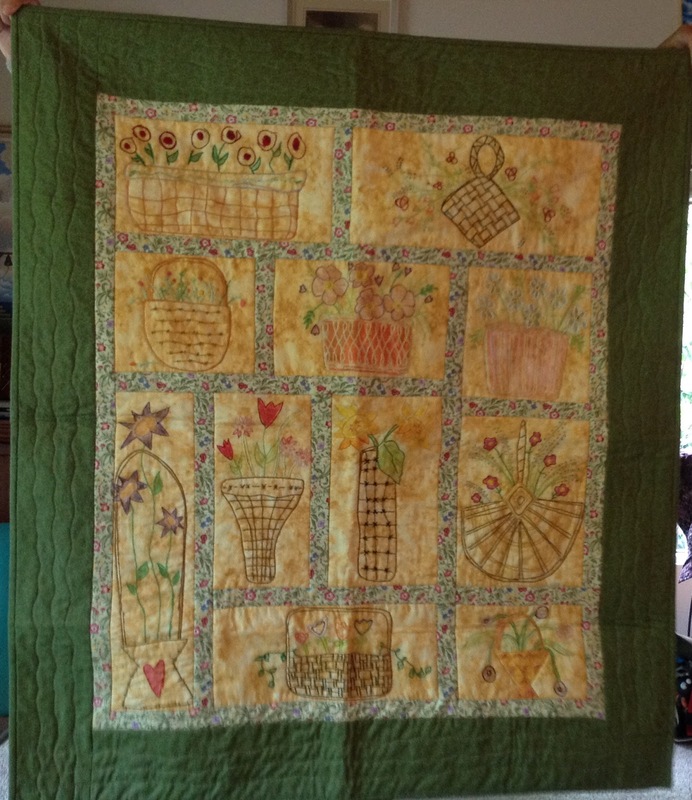 I'm sorry to say that I sold this quilt through my guild's annual quilt show for way less than I should have. Oh well. I know it went to a lady that really loved it. I don't remember the year. It was around 2010. 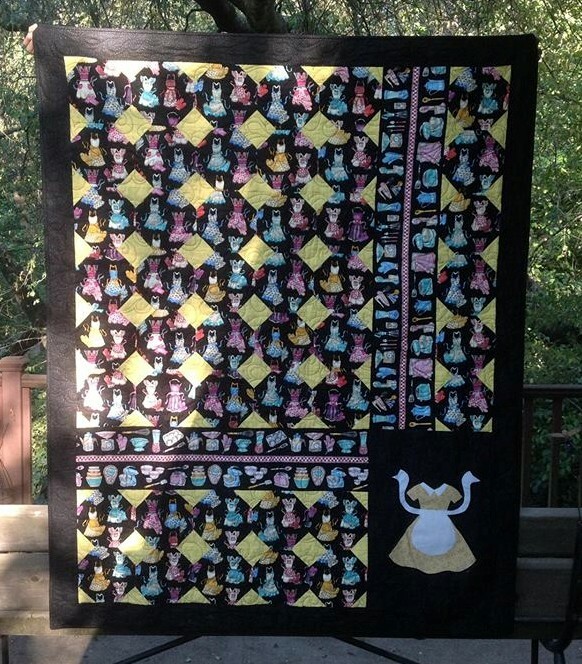 Someone in our guild organized a row quilt. There were 12 who signed up. She divided us up into two groups of six. One of our six dropped out. The rest of us wound up with a five row quilt, which was fine with me. Anything more would have been too long. I designed and made the middle row. My daughter got it next and did the row above mine. One lady did the honey jars - the row below mine. They all had something to do with bees. I told them I didn't care if it had applique or piecing. It didn't have to have bees. I was thinking they might just go with flowers or something. But I really love how it all came out. Mine, even if I say so myself, was the best of our group. The following is just one of the flowers and bees in my row. I put fabric yoyos in the center of most of the flowers. Really set them off nicely. I hate to make yoyos, so I got on e-Bay and bought some there. You can buy all sizes and colors. Sometimes they come and smell like smoke. I guess the crafter would sit and smoke as they were made. I just lay them out for a few days and the smell goes away. Or I get used to it. 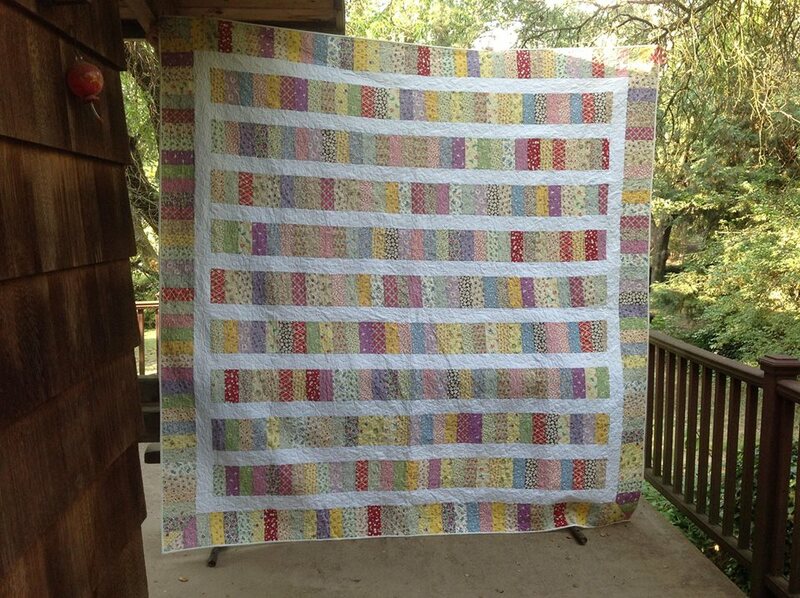 This quilt is made with 1930s reproduction fabrics, which is one of my favorites. It is on my bed. In fact it sits on my bed every summer even though it is a heavy quilt, it is very summery in appearance. Because my dog, Mochi, sleeps on our bed, too, it is washed regularly and takes the washing well. I never dry it in the dryer, though. I hang it over my metal dining chair backs. Unless it is extremely warm, it takes usually two days to dry. 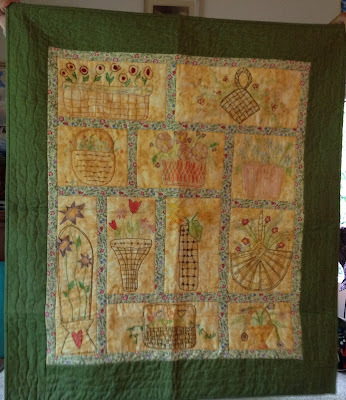 It is also hanging sideways because it is such a big quilt, my family members couldn't hold it high enough off the deck the right way. The following quilt is one I made in 2014. It is made using three precut packages and some white with pink polka dot fabric. I had just finished it when my sister Anne came to see me. She had been asking me to give her a quilt.I offer her this one and she loved it. I forgot to take a picture of it before she left, so she took the following pictures and sent them to me. Nice quilt. Her dog "Piss Willy" likes it, too. I made the following three quilts last year - 2014. They are truly round even though they appear lopsided. I kept the top one, gave one to my sister, Kris, and one to my mother. They were fun to make. It is always easier to make more than one and do them like an assembly line than making one and then making another one like it. It gets boring the other way. They really are beautiful quilts. Gil volunteers at Haggin Oaks Golf Course. Two years ago [in 2014], he volunteered me to make a quilt they could raffle off at a charity golf tournament and Country Western song fest they have every year. This is what I came up with. The logo in the center is the Golf and Guitar logo.